This is a book for adventurers! With very little preliminary, other than a list of needed tools, the reader is launched right into the thick of creating. Stephanie Lee invites us to join her on an epic adventure, a journey that took place long ago and far away. As she journals her ethnographic and archeological finds, she introduces us to each new project. The book is divided into two parts: cold connections and flame joins. All techniques are well-explained and quite accessible for the person with some basic tools skills. 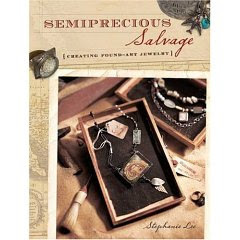 This is an excellent inspiration book for those who would like to make found object jewelry, whether you have a little experience or a lot.